The Bazaruto Archipelago is the most popular tourist destination in Mozambique and offers a plethora of fun ocean activities as well as stunning surroundings to enjoy while doing absolutely nothing. The islands are famous scuba diving and fishing destinations, and visitors without diving expertise can enjoy glorious snorkelling along the pristine coral reefs. Various watersports are possible, including sailing, water skiing, kayaking and wind surfing, and conditions are wonderful for swimming. The water is pleasantly warm all year. 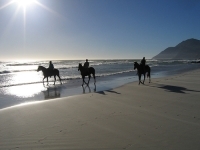 Land based activities include horse riding along the beach, bird watching, hiking along dramatic sand dunes, 4x4 safaris to explore the island landscapes, and, of course, sun bathing. Travellers tend to arrive in Vilanculos (there is an international airport just outside the town) and are ferried across to the islands in traditional dhows. The town of Vilankulo, or Vilanculos, is worth exploring, with a bustling central market and some good bars, restaurants and shops, giving tourists a taste of local culture. Many choose to stay in or near the town on the mainland and enjoy daytrips to the various islands, but there are luxury resorts to luxuriate at within the archipelago. We are looking for contributors for our Bazaruto Archipelago travel guide. If you are a local, a regular traveller to Bazaruto Archipelago or a travel professional with time to contribute and answer occasional forum questions, please contact us.